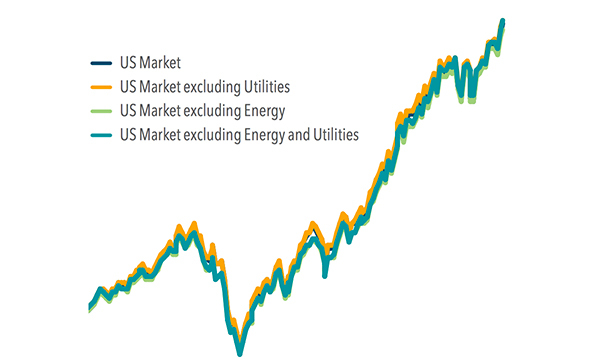 In a just-released white paper, Dimensional Fund Advisors finds that since 1975 the exclusion of all energy and utilities companies from an equity market index portfolio did not have any material impact on average returns or volatility. The same is true in developed markets outside of the US (since 1990) and emerging markets (since 1995). Since there’s no reason to believe the next 40 years will be better than the past 40 years for fossil fuel investments, there’s no longer even a financial justification for holding Exxon Mobil and other major contributors to global warming in your investment portfolio. As climate change effects intensify, downside risks of such carbon-intensive assets may even escalate.